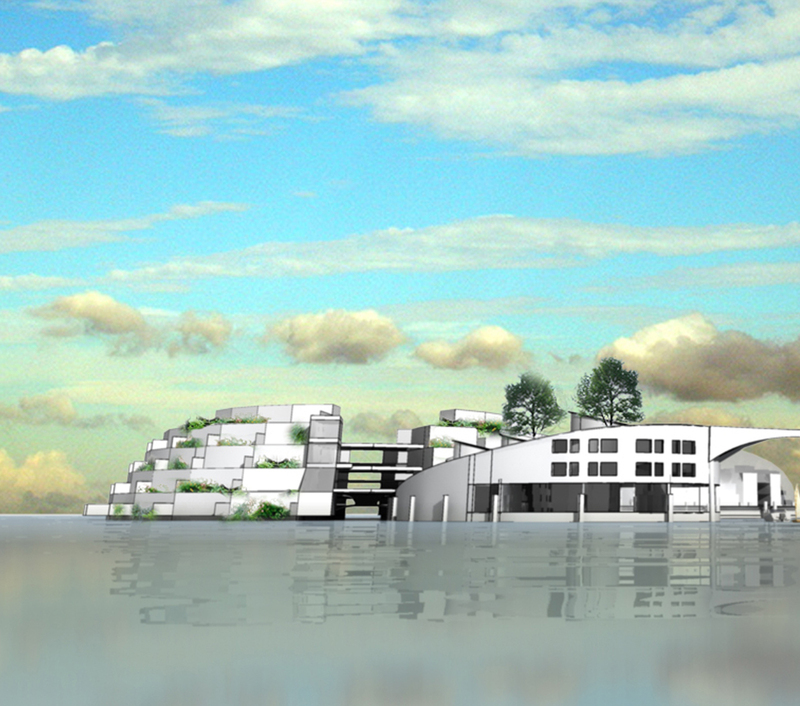 Loed Stolte is the winner in the competition by the muncipality of Delft to design a sustainable floating house for the Harnaschpolder. 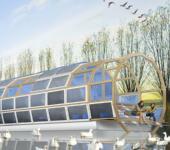 Loed Stolte’s design Sustainable Shell has its architectonic roots in the art of building ships. A ship hull, a wooden frame paneled with timber planks, is transformed into a shell that determines the main shape of the house. The continuous form makes the interior and exterior naturally merge into each other. An orthogonally outlined glass enclosure works as a geometrical counterpoint to the curved shell. Starting from the S-shaped spine, the house unfolds itself more and more to the water. 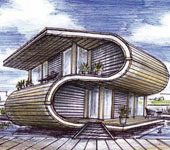 Special architecture houseboat from standard building elements. Het Markermeer tussen Almere en Amsterdam is aangewezen als locatie voor drijvend bouwen door het ministerie voor Verkeer en Waterstaat. Staatssecretaris Huizinga faciliteert deze ontwikkeling door 1100 hectaren te reserveren voor Amsterdam, Almere en Lelystad. Dit is een belangrijke stap om drijvende verstedelijking mogelijk te maken. Ingenieursbureau DeltaSync gaf een reactie op deze ontwikkelingen in de Telegraaf, op nationale televisie en in verschillende radio programma’s. Op Radio 1 behandelt BNN het belangrijkste nieuws in de uitzending BNN Today. Op vrijdag 14 november 2008 kwam in de sectie Todays Talent Bart van Bueren aan het woord. Bart ontving de Young Technical Professional Award voor het op gang brengen van drijvend bouwen in Nederland. Bart’s “kindje” is het ontwerp van een drijvend paviljoen dat aan Al Gore getoond werd toen deze de Rotterdam Climate Campus opende. Beluister de uitzending van 14 november hier; Todays Talent vind je tussen 1:32 en 1:40. UPDATE: (In English) Also in November, Bart van Bueren’s design of a floating pavilion featured as the first English spoken item (after 7 minutes) in a Norwegian broadcast on handling the climate change. In this item a scale model of the floating pavilion is presented as part of the Rotterdam Climate Initiative. The same scale model was shown to Al Gore when he opened the Rotterdam Climate Campus and also at the Poznan climate conference. Rebuilding New Orleans: why not float? During my visit this summer in the USA, I went to New Orleans for a couple of days. New Orleans has always been very well known for its lively music scene, its beautiful French (actually Spanish architecture) District, its rough harbour-image and its Cajun kitchen. Since 2005 New Orleans is well known for something else: Hurricane Katrina. In august 2005 hurricane Katrina struck the coastline of Alabama en Louisiana. Great damage was done by the wind, but even more by the floods that were a result of the storm, and the fact that large parts of the city are below sea-level, behind the levees. 80% of New Orleans was flooded. 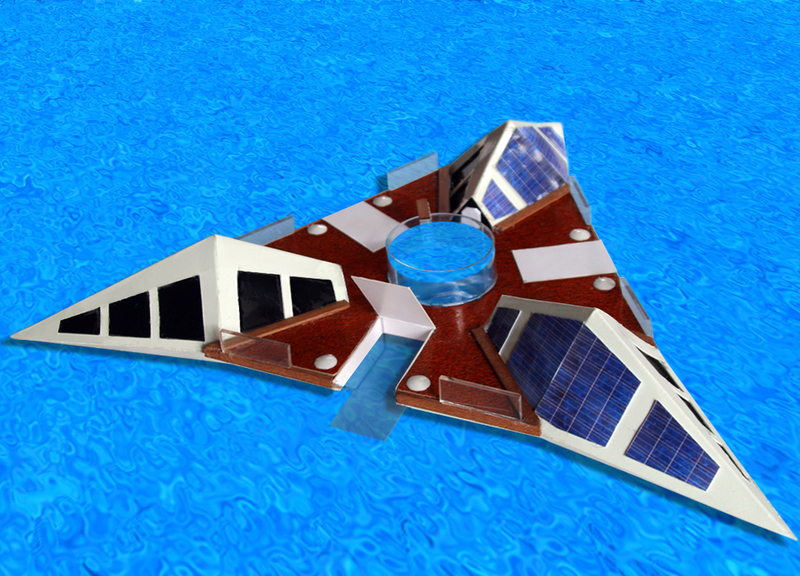 The Cepholopod 1 is the result of the way of thinking of a designer/sculptor about floating houses. Ben Rigby’s design consists of three diamond-shapes meeting each other in the center triangular form. Because of the sharp edges, this form can easily absorp the energy of powerful waves. The Cepholopods energy comes mainly from solar panels installed on the houses, and from wind turbines which erect automatically from the deck in case of wind. 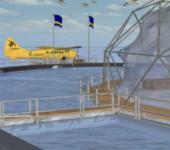 At times of heavy weather the turbines can lower into the deck, completely flattening the deck, so that waves and wind can easily move across the Cepholopod. One Cepholopod provides space for 3 apartments. Each apartment has his own docking station for a small boat to get to the shore. The water can be pumped out of the docking stations, so that the boat won’t be damaged in case of heavy weather.